Stay focused knowing feet are protected with Under Armour's Men's Stellar Tactical Boot. 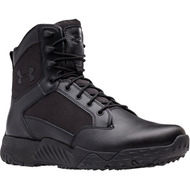 Engineered for all-day use during demanding jobs, Under Armour continues to deliver quality performance. The DWR treated leather and 900D nylon uppers work together to create a quick-drying boot that can stand up to rigorous tasks. Quality leather and the polishable toe ensure a sleek professional look. Designed for maximum versatility, low profile rubber lug outsoles guarantee a reliable grip over rapidly changing surfaces. Designed for ideal foot protection, a TPU shank provides increased support while a molded EVA midsole absorbs shock to reduce foot fatigue. Because comfort is priority, the Stellar boot uses an OrthoLite liner to prevent fungal build up.